In the spirit of the new year, I’ve decided to make a list of fashion resolutions. Looking back, I’ve made some pretty questionable garment choices this year. Why did I ever think I could pull off glittery harem pants? Embarassing. However, I’m not the only one who's committed fashion crimes this year. From glorified gaucho pants to socks and stilettos, 2014 had its own list of wardrobe failures. Let’s start 2015 with a clean slate, and bury these five trends forever. Culotte is just a fancy word for gaucho. Remember when gaucho pants were considered cool a decade ago? No? That’s because they weren’t. Culottes are somewhere between flared capris and the gaucho pants your 13-year-old cousin wore to middle school for a year. Seriously, this trend is the worst. 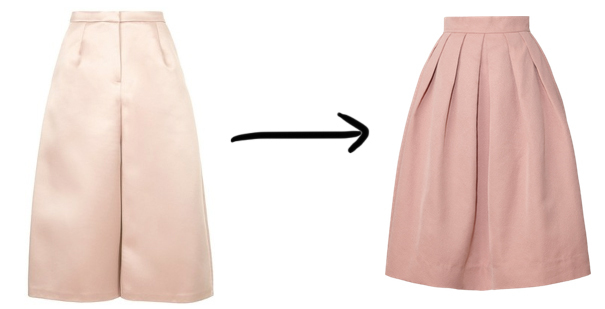 Instead: Try an A-line skirt. Bad designer puns had a good run. I’ll admit, I even bought into it. Two years after the start of this trend, however, I’m tired of seeing shirts with “Homiés” and “Féline” screen printed all over them. When fast fashion retailers start ripping off designs that were imitating other designs to begin with, you know its time to move on. Instead: Invest in something from the actual brand that will outlast trends. I previously expressed my disdain for normcore in this article. Socks and stilettos were never ironic or cool, and is a trend that’s best left to people like Rihanna (let’s face it, anything would look good on Rihanna). Phrases that come to mind with normcore include “Can we not?” and “Just stop”. Instead: Just buy a pair of Nikes. This one isn’t just me. Printed pants have been been statistically proven to be going out of style by online market research that was conducted on Black Friday. Flared, skinny, or culotte (I hope not! ), your legs are going to be seeing a lot of solid colors in 2015. 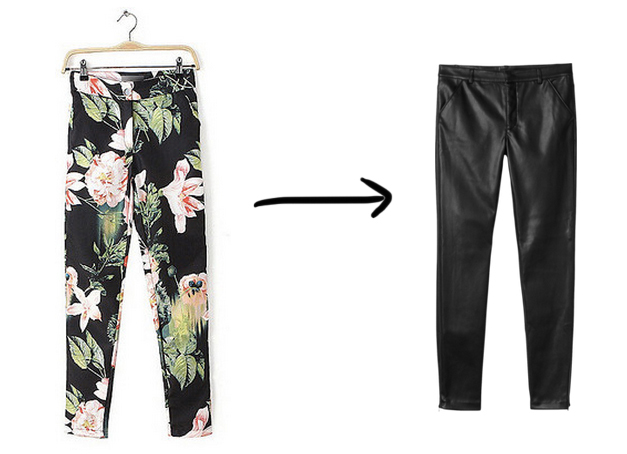 Instead: Try pants in an unexpected textile, like leather or velvet. It wasn’t cute when Miley did it, and it’s still not cute now. Unless you’re a toddler or a cartoon character, this double bun hair style needs to be locked in the closet along with the Bumpit and sock bun. Instead: We dig Miley’s chic and sassy pixie cut.